Teeming with salmon from Ken Roberts on Vimeo. Bear reminders from Ken Roberts on Vimeo. Euphoria had quickly passed. Suddenly aware of situation potentially unfolding. A very real risk aggressive bear encounter. Best to slowly move off, further along the highway, and leave the cameras stowed. Moments earlier I’d spotted a black bear pad majestically across the road, descend into a small ditch and then carefully pick a path amongst the vegetation on the steep banking beyond. It stopped, sensing my presence, and watched me for a few moments before continuing upwards into the thicker undergrowth. My first sighting of a bear, of any sorts, in the wild. A few miles short of the town of Terrace. Perhaps a hundred yards away, maybe a bit less. I’d not, to my surprise, felt particularly frightened. No inclination to so much as place my hand on the bear spray holstered on my hip. Instead, albeit briefly, transfixed by the creature’s beauty. Then the realisation that this was a small black bear. No sign of the mother. Aware that to come between them, however inadvertently, would be extremely dangerous. Real risk of an aggressive encounter. To my left the bear, now only just visible amongst the undergrowth. To the right, the Skeena river. Fertile fishing ground, and the direction from where the animal had come from. And railway tracks, along which a lengthy goods train was passing. Which, I suspected, was what had separated mother and cub. Quite a lot of rolling stock had already passed. I’d guessed the train would be fairly long. There’d been three power cars at the front, and the wagons sounded empty, clattering noisily as they rolled by. There’d been a couple of loud blasts on the horn on the driver as he’d gone past. Encouragement I’d thought as I’d waved back. But perhaps it had been a friendly warning. I needed to leave before the train was gone. If you go down to the woods… from Ken Roberts on Vimeo. Ken stops for a short lunch break along the Skeena river, between Prince Rupert and Terrace in Canadian British Columbia.. Peaceful spot. No bears.. Warning signs from Ken Roberts on Vimeo. Ken discovers a sign warning of bear presence at an overnight stop along the Skeena river between Prince Rupert and Terrace in Canadian British Columbia. But it’s not a deterrent, it’s encouragement. Still to see one of the cuddly critters in the wild… Outside of his tent of course..
Much, if not all, of my journey had been through uncharted territory. But now I was heading for Prince George, surprised to discover my parents had visited a decade or so earlier. They’d much more of an idea of what lay ahead than I did. Knew they visited North America quite a bit, but not this far west. Had they, I enquired, seen bears? Yes, replied my Mum. But, there again, everyone but yours truly has. Whether we’d got it right or not, it did seem to be working. The bear precautions Mike and I had taken been a great success. Too much so. Never saw a single one in all of Alaska, Canada’s Yukon Province and northern British Columbia. Not one. Other than in captivity. 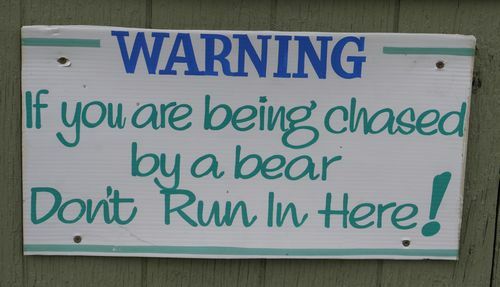 Not that we’d gone to extremes to deter bears. Sought to balance risk against simple practicalities. Keeping our food away from the tents. Each securing our stash in waterproof dry bags, the contents packed in special odour proof plastic bags. We’d avoided using deodorant, adhering to the principle it’s best to smell err.. human. 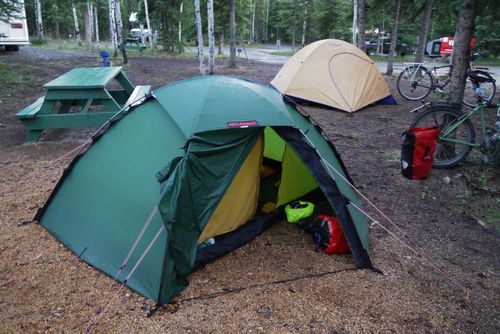 Some had suggested you should have only the absolute minimum in the tent – sleeping bag, mat – and bear spray of course. Premise being toothbrushes, plastics and a plethora of other manmade items emit odours that could attract unwelcome visitors. 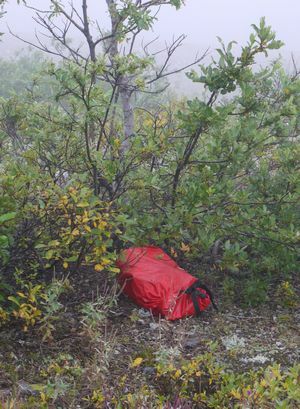 We’d both balked at this, fearful that placing most of our kit away from our camp would simply get it stolen. By two legged miscreants. Besides, we were hopeful the food stash would draw the bears away from us. There’d been conflicting advice as whether it was best to wild camp or use an established site. The former meant you were on your own, admittedly amongst bears who’d usually no interest in people, whereas the latter appeared to offer safety in numbers. 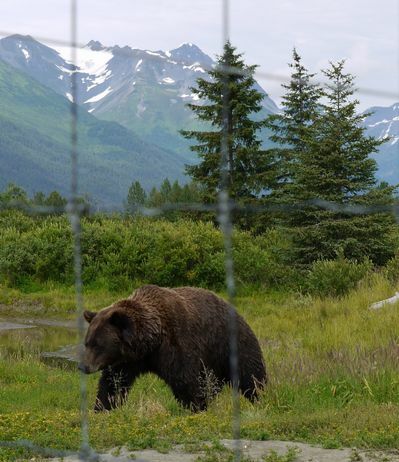 That said, if food had been habitually left out, there was a real risk you might encounter a garbage bear – one conditioned to forage amongst humans. 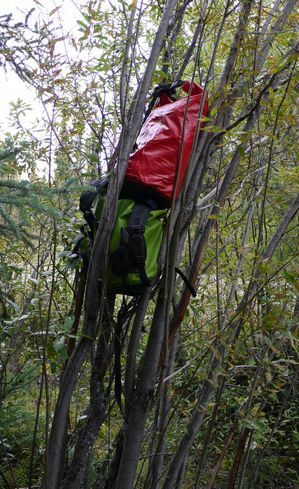 Much of the time we’d had to stow our food bags on the ground, or just off it to avoid pilfering by the smaller critters, rather than suspend it from a high tree branch far out from the trunk. Wrong sort of trees. We’d generally cooked away from the tents. But as for showering and changing one’s clothes before retiring for the night. Often impractical. So, what had I settled on? Keep my food a hundred metres or so from the tent. Remainder of my kit stowed in the panniers under the fly sheet. Bear spray always to hand, together with a knife should I have a violent encounter with a black bear, and satellite telephone in case I need to call the cavalry. Preference for wild camping, or clean, organised site amongst, or close, to towns or villages. And always cook away from the tent. Sensible precautions rather than simple paranoia. You have been warned.. At White River, thirty miles south of Beaver Creek in Canada’s Yukon Province. Camping at Deadman’s Lake had really been about raising the stakes. 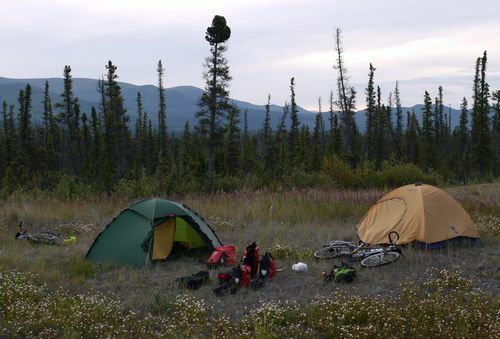 Mike and I had both stopped at organised sites, close to or in settlements, but had yet to wild camp in bear country. Deadman’s was the half-way house, the next step. Far more remote than those either of us had used before. A State run site, facilities were limited to a few composting toilets, a shelter, nothing more save for a warden living in a caravan. We never saw him, but the place was free. There were a few others around. A Swiss couple in their RV – recreational vehicle. Imagined them to be pretty wealthy as it had Swiss plates. And friendly they were. The lady spoke good English, and her partner seemed appreciatively of my smiles and enthusiastic, if poor, efforts at schoolboy French. Very jovial I thought. Next morning we were pleased. No bear encounters, and our food stash untouched. Agreeing we were now ready for the next step. Wild camping. In the Canada’s Yukon Province.